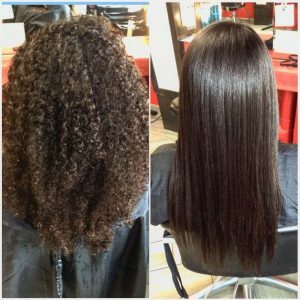 Sleek, straight hair is a style that’s come and gone for decades, ever since women were using clothing irons for hair straightening. Fortunately, the super simple style is back in again (and we have professional tools this time), as we’ve seen it on celebrities such as Kim Kardashian or supermodels like Bella Hadid in recent months. This look is perfect for those days in between shampoos when you want something a little nicer but low-effort, since dealing with hair on day two or even three of not being washed can be a little bit difficult. That being said, this look is so versatile it can also be created with root lifting shampoos that are meant to make the hair sleek and straight, despite being freshly cleaned. Begin the look in your shower, where you’ll accommodate depending on your shampoo schedule. For freshly shampooed hair aim for a root-lifting product that will build necessary volume to avoid looking too flat. Condition the ends and pat your hair dry with a towel. Next, you’ll want to add a hair oil or heat protectant since you’ll be working with a hair straightener here. To add volume, use a round brush while you blow dry to lift the hair up and away from the root in small patches, giving your hair the opportunity to lift in targeted areas. Once you’ve dried your hair, continue to section it off into small sections. Make each section just big enough to fit in your hair straightening tools but not too thick to get the most benefit out of your iron. All at the same time, run your round brush and then hair straightening tool through the section you’re working with a few times until the hair looks sleek and straight as desired. Iron as if you’re lifting the hair up and away from your head in order to not flatten the volume you just created with your hair dryer. Make sure to pull the iron completely through, ending at the ends of your hair to assure that it’s all been straightened correctly. Once you’ve finished going through each segment of hair with your hair straightening tool, finish the look off by using hairspray all around the head to hold the look together, and complete it with a finishing crème on the ends to assure they stay as sleek as your roots throughout the day. 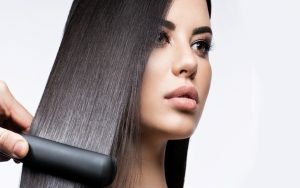 Our stylists at Aaron Emanuel are experts at hair straightening and can give you the perfect sleek look you’re looking for with a styling appointment.